Windows Live Hotmail has been enabling and supporting push email through Exchange ActiveSync (EAS) protocol. With push email, user can sync email messages, contacts and calendar between mobile device and Windows Live cloud, and any update such as new incoming email in Hotmail will be automatically pushed to the phone for instant notification. Here’s the guide on how to setup and configure a Hotmail account with push email support on Android mobile phone device, through Exchange ActiveSync service. The guide works perfectly for smartphone running Android 2.2 and above, i.e. Android Gingerbread 2.3 and Android Honeycomb 3.0 or 3.1. Note that HTC Mail that comes with smartphone such as HTC Desire, HTC Desire HD, and HTC Incredible S has known issue when setting up Hotmail through Exchange protocol. 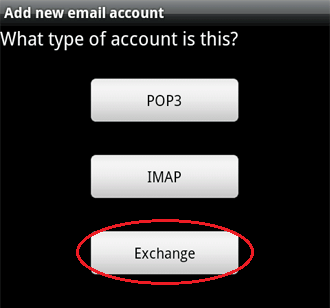 At the final step when adding a Hotmail Exchange account, HTC Mail app will return “Failed to create the account. Please try again later.” error. 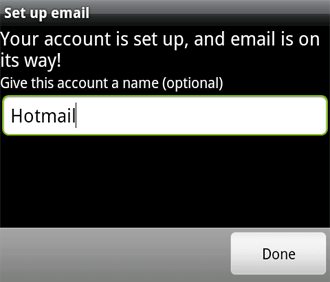 So far, only HTC Mail is known to have incompatibility issue with and does not work properly with Hotmail via EAS. Other Android mobile phone which comes with stock Android Mail app such as Google Nexus One and Google Nexus S should not facing such error. An alternative for which can be downloaded from Android Market, also for Android 2.2 Froyo phone, is Improved Email, though it’s unofficial app but similar with stock default email app on Android. On Android device, open Email app. Enter the MSN/Windows Live Hotmail email address and password. Select Exchange as type of account. In other version of Email app, Domain and Username fields are combined into one as “Domain\Username”. In this case, enter your Windows Live/MSN Hotmail emaill address into the field preceded by a “\” (backslash). For example, \username@hotmail.com. You can then configure various Account options for the just added Hotmail account. To enable push email, set Email check frequency to Automatic (Push). 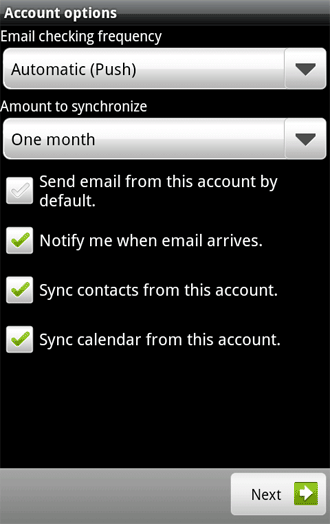 Note: If your mobile phone is running on Android version 2.1 or below, do not sync contacts and calendar which is not fully compatible with older versions of Android. Enter a name for the account, such as Hotmail or Windows Live Hotmail, and tap Done. New incoming emails will have notification alerts appear in the notification bar and/or through sound alerts.